Great experience touring the Pucusana fishing village and fishing boat. Antonio our tour guide was terrific - very well spoken and trained as a marine biologist. Picked us up from our hotel in a nice roomy SUV, stopped at a place along the way that makes freshly baked bread in brick ovens the bread was to die for. He had a wealth of information about the biodiversity of the coast and surrounding area, and I was impressed by his expertise. 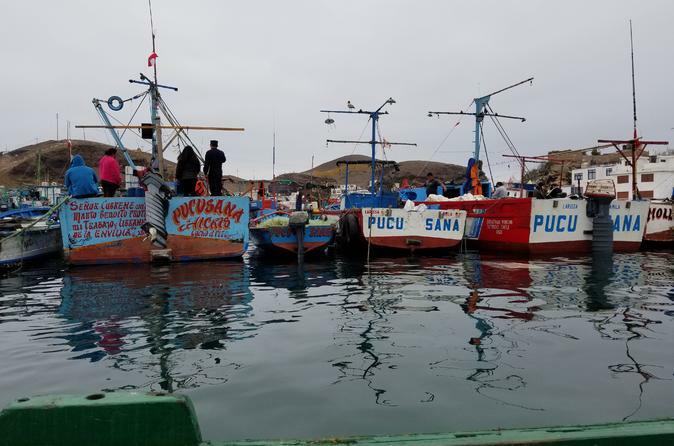 Pucusana is a village from another era - it was amazing to see all of the fishermen waiting to go out in the boats and all of the colorful fishing boats. We took a tour around the inlet with a local fisherman in his boat and the wildlife views were amazing - penguins, terns, sea lions. The water was absolutely crystal clear, no pollution at all. My only regret is not trying the ceviche in one of the local bars near the port - probably would have been the best seafood experience ever. Overall, a very enjoyable time for my family and I. A wonderful experience beginning to end! A highly informative,colorful and exciting boat excursion to see all the animals on Galapago Island. And best of all was our terrific guide and driver Antonio. He was very professional, prompt and knowledgeable! We also made a stop at a local bread market which was very popular! This was an awesome trip directed by an experienced guide and excellent driver. We loved the fishing village that was our destination and the boat ride seeing all the wildlife made this trip a cost effective journey. Timely pick up by a very infomitive guide. We had a very nice van to the fishing village which included a stop for some wonderful fresh bread right out of baking ovens along the way. The fish market and the boat ride around an island with many birds and sea life sightings made the day. Spent a relaxing Sunday morning observing life in this small fishing village that is off the beaten track and not the usual shore excursion offered by cruise lines. We were picked up on time by Nilton and driver Hugo and driven in a nice, air-conditioned van to Pucusana. Along the way we stopped at a couple of view points and Nilton told us about life in Lima and Peru, the problems the inhabitants face with water shortages while living next to an ocean, and we were able to ask him questions. Nilton spoke perfect English and had lived in the US so was easy to talk to and very knowledgeable about problems facing environmentalists today. When we arrived we boarded a small motor boat and went out to an island teeming with several species of birds, including the inca tern and the rate Humboldt penguin. Since we were the only passengers that day, and since my husband is a nature photographer, the boatman was very accommodating to our requests to stay longer in a spot or go back to another one for a better photo. After the boat trip, we walked along the wharf, watching families out for a Sunday of fun before returning to our hotel. A most enjoyable day!